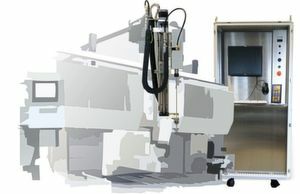 EDM Drilling – The first EDM drilling units Heun Funkenerosion offered over the years are all-purpose modules with an adaptable eroding head with a servo unit and a mobile generator equipped with a high-pressure pump. 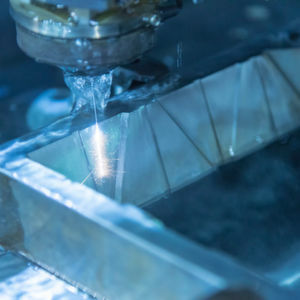 Today, these modules are still available, but they now come with several improvements, the EDM drilling machine expert says. The EDM drilling units from Heun are used for special tasks like for the removal of rivets from the outer plating of airplanes during maintenance, relief drilling activities and bleeder holes. They are also adopted for drilling cooling holes in metallic moulds, drilling holes in injection nozzles and EDM drilling jobs with extremely pointed angles. Heun explains that its eroding units have high EDM drilling speeds and can be applied in many different fields of EDM drilling. Every kind of conductive material can be machined, be it soft or hard. The drilling unit is compact and good for machining big work pieces as well. Its generator and monitor are located in the solid, mobile control cabinet . It has a water-cooled generator, which can be run up to 80 Ampere. The self-explanatory operating interface is controlled by a touch-screen terminal. While the eroding head can be attached to machining centres or tooling robots, mounted independently on a stand or drill rig is also possible. The electrode material used are brass, copper or graphite and different ceramic guides can also be installed. This enables a range of electrode diameter, from 0.3 – 3.0 mm. Furthermore, with special collet chucks, electrodes diameters of 0.1 – 6 mm can be clamped. Optionally machining with electrodes of up to 50mm is possible. Every electro-conductive component can be machined. Eroding heads of different lengths are offered with a maximum travel distance of 3,000 mm. The head-generator unit has an analysis tool to control the drilling process. It is also possible to connect the unit to another machine and pass signals to it. 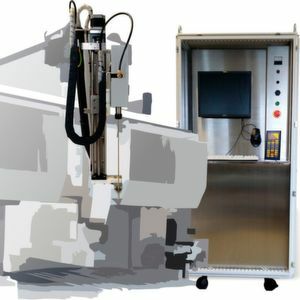 The Heun unit has functions of a standard EDM drilling machine, but has a special feature – its spindle can be locked in place to carry out die sinking or cut off parts, such as threaded bolts and sheet-metal parts. The most common application field is, however, to remove broken taps. Normally through-holes are machined, while blind holes must be machined manually - all made easy with Heun's units.